A team from Kirensky Institute of Physics, Federal Research Center KSC SB RAS (IP SB RAS) together with their colleagues from Siberian Federal University (SFU) studied the properties of the ferromagnetic material PbMnBO4. They found out that the unique magnetic and thermal characteristics of this compound are determined by its specific magnetic structure. 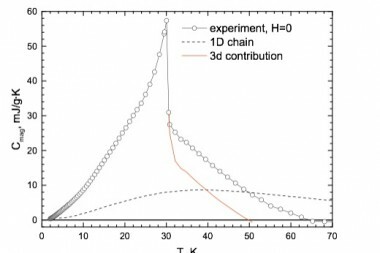 The work was supported by the Russian Foundation for Basic Research, and its results were published in the Journal of Magnetism and Magnetic Materials. A PbMnBO4 crystal is distinguished by its ferromagnetic properties: at certain temperatures (below the Curie point) they can possess magnetism in the absence of an external magnetic field. Oxides rarely are ferromagnetic, and the nature of their magnetism is different from that of ferromagnetic metals. Magnetic moments of atoms or ions in non-metal crystals are arranged in a special order that is destroyed when the temperature increases and a critical point is reached. In compounds like this all magnetic moments have the same direction. Earlier studies have shown that the source of the ferromagnetic bond in a PbMnBO4 crystal is a special property possessed by a trivalent manganese ion that lowers the symmetry of its oxygen surrounding. 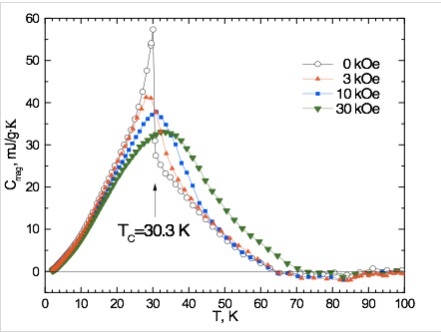 Having studied the properties of the compound, scientists found out that certain signs of the magnetic order remain in place even when the temperature increases above the critical level. That is why the compound’s magnetic and thermal properties were considered below and above the Curie point. 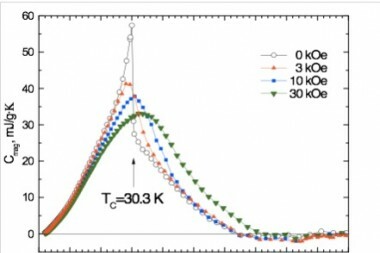 Heat capacity measurements helped study the magnetic order that was maintained above the Curie point even in the absence of a magnetic field. “We found out that magnetic order traces in the absence of a magnetic field remain up to the temperatures which are twice as the Curie point. In the presence of the field the interval gets even bigger,” says Anatoly Pankrats, a PhD in physics and mathematics, and a lead research scientist of the laboratory of resonance properties of magnetically ordered materials at IP SB RAS. The reason for these peculiar features is the unusual magnetic structure of the crystal. It contains chains — elements with intensive exchange interactions between magnetic moments. Structures like this are called quasi-one-dimensional. When a PbMnBO4 crystal is cooled down, the magnetic order first forms inside the chains and then, with further cooling, between them. 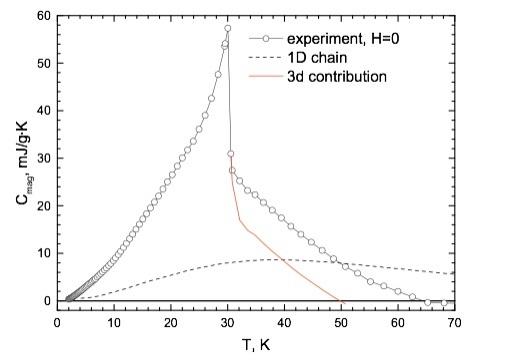 Structural peculiarities of this compound are not as strongly expressed as in traditional quasi-one-dimensional magnetic materials, but they influence the compound’s magnetic and thermal properties. The scientists assumed that due to the presence of a lead ion the compound would also have multiferroic properties. Multiferroic materials have several interrelated ordered subsystems: a magnetic, an electrical, and an elastic one. Among other things, the interrelation leads to the occurrence of magneto-electric effects: an electrical field may induce magnetism in a material, and a magnetic field may cause electric polarization. This property is used in spintronics, a new area of electronics in which current is affected both by an electric and a magnetic field. However, in case of the PbMnBO4 crystal the magneto-electric response was very weak. The work was carried out in the framework of a larger-scale study of functional materials that may be used as sensors or working elements of devices and data processing equipment. The search for new functional materials and the study of their physical properties will broaden the scope of electronics.